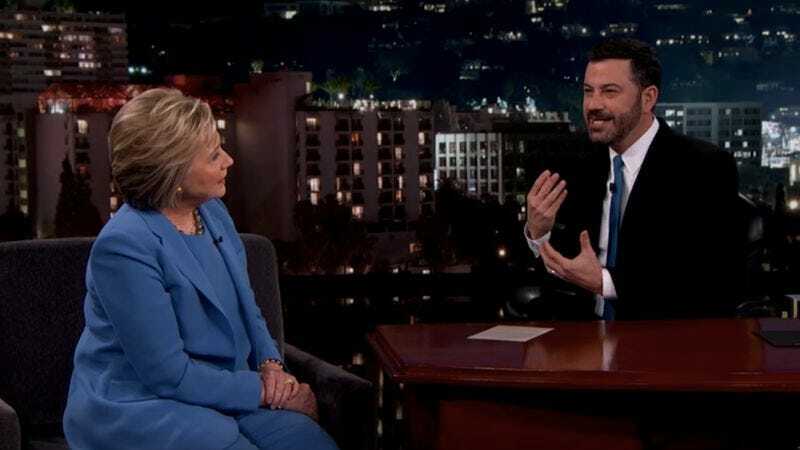 But last night, Hillary Clinton got a useful dose of it from Jimmy Kimmel, after she defined it for him as the act of a man explaining something to a woman in a patronizing way. “Actually, it’s when a man explains something to a woman in a condescending way. But you were close,” he says helpfully, demonstrating why it’s so important that guys continue to help women out in this manner. He then gives her a series of suggestions as she tries to deliver a routine speech, critiquing everything from her clothing to manner of speaking to facial expressions, in contradictory terms. “It’s like nothing I do is right,” she eventually points out. “Exactly. You’re not doing it right. I can’t quite put my finger on it. It’s something. It’s that you’re not…” he trails off, unsure. Kimmel is so relieved when she replies, “A man?” because indeed, that was the problem all along. She also has some pretty crappy foreign policy ideas, sure, but in this case, it was the female thing.